My family enjoys this recipe. It is very flavorful, tender, and moist. There is plenty left for seconds or leftovers for the next day. Spread sliced onions and chopped garlic cloves on the bottom of the crockpot. In a small bowl mix together the brown sugar, chili powder, salt, cumin, and cinnamon. Pat to dry the pork shoulder then rub the spice mix all over the pork shoulder, using it all. Place pork shoulder in the crockpot on top of onions and garlic. Using mesh strainer, separate liquids from garlic and onions, placing the vegetables back to the crockpot. Shred the pork shoulder using 2 forks into small pieces and discarding fat. Place shredded meat back in crockpot, stirring onions and garlic and adding the 2 cups of barbeque sauce. 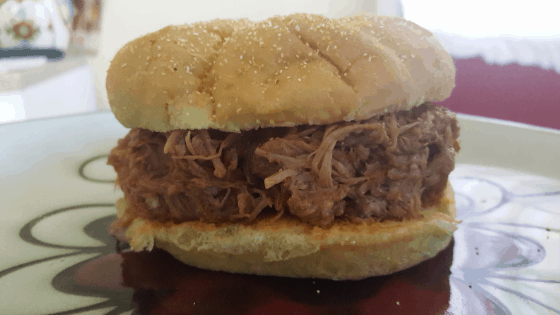 Let me know how you like your pulled pork below!